Few days ago Microsoft ends its support for Windows 7 operating system. But still some people won't upgrade to Windows 8/8.1 version. Some of them already have upgraded the version of the operating system, but Windows 8/8.1 users have seen that in start up there is no sound. When you are logging into your Windows 8/8.1 there is no sound for the welcome as in Windows 7 you can hear the welcome sound. For some people that's doesn't matter if sound exists in start-up or no. 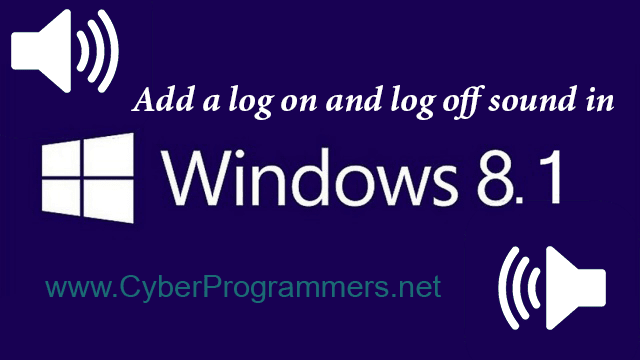 And in this post, I will show you how to turn on a sound in Windows logging on and off process. 1) First of all, you need to open Run just by using Win+R keyboard combination. 2) And type in regedit, after hit enter. 3) Now navigate to HKEY_CURRENT_USER/AppEvents/EventLables path and select WindowsLogon. 4) Now in right side panel double click on the ExcludeFromCPL and change its value from 1 to 0. 5) Now you need to do the same process with WindowsLogoff. 6) After open Control Panel, set the View to "Large icons" and from the list choose Sound. 7) In newly opened window from the top, select "Sounds" tab. 8) In "Program Events" scroll down to get the "Windows Logon" and "Windows Logoff" lines. 9) Select one of them and at the bottom, you can choose which sound you want to appear on Windows logging on or logging off time. After you have done, simply press the OK button.